I had heard about The Spotted Pig since I began working in the wine industry. It was a Mario Batali restaurant. Except it wasn’t a restaurant. It was a gastro-pub, as the English so elegantly branded the concept of a pub serving restaurant-quality cuisine. And it was the only gastro-pub in New York. It served great hamburgers. It had home brew on tap and wines at good prices. It was somewhere in the West Village. And I kept hearing great things about it. I actually went looking for it one day en route to a favorite brunch spot, but amidst the confusing array of West Village street names and other distractions I never made it. And the last thing I heard it had closed down for renovations. So I could barely contain my excitement when I discovered a few weeks ago that New York’s only gastro-pub had recently reopened! Since there is a no reservations policy – it is a pub after all - it’s advisable to get there before 7.30pm to snag a table, though there are worse bars to hang out at and enjoy a pint. And nowhere else can you savor the delicious Spotted Pig Ale, a rich, heady ale served British-chilled, i.e. lukewarm. But it’s not the beer you’ll come back for. It’s the awesomely hedonistic, British-Italian influenced food that pretty much gives the finger to any folks trying to mind their cholesterol. There are no starters or mains on the menu per se, only a selection of Bar Snacks, Sides and Plates that beckon attention. I sampled the Pork Belly with Chickpeas, heinously fat, but bursting with flavor, and the Chargrilled Burger, with Roquefort cheese in the patty. Both were rich in flavor and overdelivered on satisfaction when paired with a ripe, fruit-laden red blend from Chateau du Prieure des Mourgues, in the Southwest of France. Other dishes that caught the eye were the Striped Bass roasted and served with Slow-Cooked Cranberry Beans & Tarragon and the Smoked Haddock Chowder. Pic: Gnudi - heaven in a bowl? The star of the meal was undoubtedly the Gnudi, which is offered under Sides but should be treated as an Appetizer and the perfect introduction to gastro-pub cuisine. 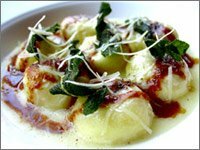 Essentially a small bowl of ricotta dumplings in their own Parmesan and sage sauce, this dish alone is enough to make The Spotted Pig one of the most visit-worthy and thoroughly enjoyable resta- er, gastro-pubs around. And if it closes down again and doesn't reopen, you'll never forgive yourself for not going. Bonus: Kitchen open till 2am, 7 days a week.